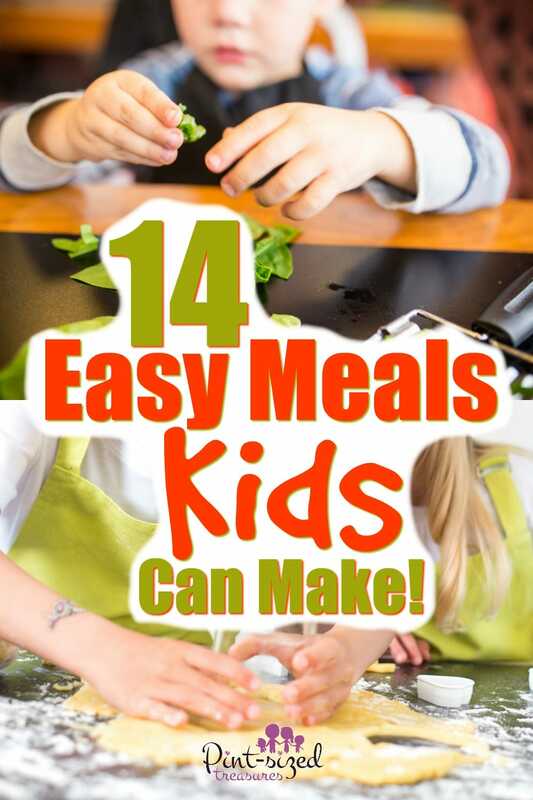 Home › Parenting › 14 Easy Meals Kids Can Make! These Easy Meals Are Perfect for Kids to Make! Did you know kids can cook? Yep, they can. And they should! Letting your kids get messy in the kitchen is an awesome learning experience for them. Cooking for themselves is a life skill they need to learn fast. And most kids end up loving cooking or baking once they learn about ten recipes! “Mom, do you like cooking or cleaning better?” asked my eight-year-old daughter. “Well, I like cooking the best. It’s fun!” she replied with a giggle. Seriously, all of my kids get involved with the cooking. The other day, I was preparing an amazing peanut butter cookie recipe and could barely get my hands in the cookie batter because three other pairs were busy diving in! Even the two year old was rolling up cookie dough! I didn’t ask them or even tell them I was baking. I didn’t even have to tell my three, four or six-year-old what to do. And That’s the BEST Way Kids Learn How to Cook! They see mom or dad cooking and they can’t wait to try to create some recipes themselves! Depending on your child’s age, they may or may not need supervision for these recipes. I have learned that a 10-12 year-old child can make many dishes on their own, but kids younger than that need hands-on supervision and direction. Even if my older kids are cooking, I make sure I am always nearby to answer questions or to check on the progress. Letting the kids cook has been a fun adventure for our family. The kids feel needed and love the fact that they have learned a skill that many adults are still working on! It’s so Important Your Kids Learn How to Cook! 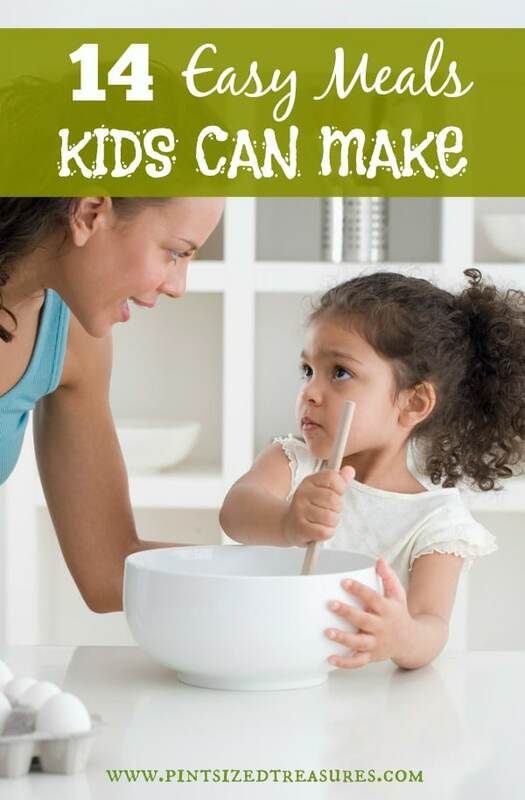 Don’t be shy about letting your kids cook! We won’t always be there when our kids need a hot, yummy meal on the table. It’s better for them to learn and make mistakes now, then to take a crash course in cooking when they are married or in college! There are way too many advantages to teaching your kids how to cook. But, always ensure an adult is home when the cooking is taking place. Before you let your kids take over the kitchen, here’s a few safety precautions! Teach your kiddos about proper sanitary kitchen rules. Teach them the danger of kitchen fires and how to extinguish them. I teach these safety tips to my kids before we cook or bake. I also re-emphasize them every time we cook or bake together. Ready to let your child begin a cooking adventure? Psst! If your child is a preschooler or toddler, just let them help on a much smaller scale. They can smear mayonnaise on the bread or roll up some cookies. Those are still important kitchen skills to learn! Macaroni and Cheese. A dish that is loved by kids all across America! Your child will love to know he can make this no-blue-box recipe. Spinach Ricotta Shells. These are healthy and are fun to fill with cheese. This could be a classier dish your child could cook for the grandparents. Five Spiced Baked Fish. This recipe is so simple, but bursting with flavors. Add a few fresh squeezes of lime for a zesty finish! Tortilla Pizza. My kids love how little time it takes to make this popular dish. Less than 15 minutes and they will be chowing down on some thin-crust pizza! Yum! Cranberry Chocolate Chip Granola Bars. This would be perfect for an older child that loves chocolate chips for breakfast! You don’t have to mention that granola bars are healthy, just point out the chocolate chips and cranberries! This recipe went fast at our house! Chicken Pot Pie — Tortilla Style. Save some tortillas from the tortilla pizza recipe and let your child whip up a hearty dinner. This is one of my oldest son’s favorite recipes! Easy Quiche. Another perfect breakfast meal! Quiches are simple and hard to mess up. Your kids will love that this dish has loads of cheese in it! Peanut Butter and Jelly Sandwiches. A classic that needs no directions. Just make sure you mix the jelly and peanut butter in a bowl before spreading onto the bread. Trust me. It tastes so much better that way! Tuna Melts. This was probably one of my kids’ first lunch recipes they tried. We typically just make or family’s version of tuna salad and throw a piece of cheese on it and bake the sandwich in the oven for about 10 minutes. Simple, quick and cheesy — three very important factors for a kid-friendly meal! Cereal.. This simple meal works well for a late dinner or a busy morning. Just open a box and pour! Yogurt Parfaits. A healthy and fun breakfast. Just lay out nuts berries, rolled oats or granola and let your kids make their own yogurt parfaits for breakfast or a snack! Soup and Salad. Just pick your favorite canned soups and heat and eat. Add a bagged salad, some shredded cheese, croutons and dressing and your child has made their first complete, easy meal! Fish sticks and tater tots. If you’re going to make one of our family’s favorite lazy lunches, then please use Mrs. Paul’s fish sticks. Please. No other fish stick will do. Pair with baked tater tots and there you go! A not-so-healthy, but yummy, hot lunch! Omelettes. Share your family’s traditional omelette recipe with your kiddo. You’ll be surprised how fast they can learn how to flip an omelette! What easy meals have you taught your kids? Does your child cook any meals throughout the week? Share your thoughts and tips in the comments!